Online classifieds firm Quikr has acquired Stepni, a platform that connects vehicle owners with service providers nearest to them. The acquisition is aimed at strengthening QuikrCars, the vertical that focuses on automobiles including cars, bikes and commercial vehicles. It also opens cross-selling opportunities for QuikrServices and helps users find local service providers such as cooks, carpenters, interior designers and others, it said in a statement. F.O. Auto Technologies Pvt. Ltd., which runs Stepni, was founded by IIM alumni Vinay Singh and Nikhil Nair in October 2015. The company claims to have a partner network of over 125 service centres across Bangalore. QuikrCars offers automobile news, reviews, information, tips and a slew of other features such as car inspection reports as well as maximum sales price (MSP) calculator, to help users ascertain the best price range for their cars. "Stepni's business model will now allow us to develop a longer-term relationship with car owners as opposed to only at the point of buying and selling. 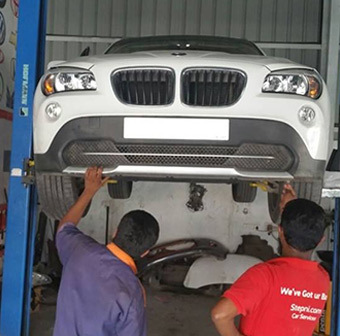 We plan to scale vehicle maintenance services to all major cities over three months," said Atul Tewari, head of QuikrCars and COO Quikr. QuikrCars competes with Google Capital-backed CarDekho, Naspers' recently launched platform Stradia, Truebil, CarTrade and Droom, among others. Quikr has made a string of acquisitions in the past to ramp up its various verticals. To augment its beauty services vertical, it acquired on demand beautyand wellness services platforms ZapLuk and Salosa. In January, it acquired real estate portal CommonFloor to expand QuikrHomes. A month later, Quikr entered the white collar jobs segment by acquiring IDG Ventures-backed Abhiman Technologies Pvt. Ltd, which runs jobs portal Hiree.com. Quikr, founded in 2008 by Pranay Chulet and Jiby Thomas (who quit the firm later), is present in 1,000 cities in India and operates several classifieds businesses across C2C, cars, education, homes, jobs and services. Quikr's investors include Tiger Global Management, Kinnevik, Warburg Pincus, Matrix Partners India, Norwest Venture Partners, Nokia Growth Partners, Steadview Capital, Omidyar Network and Ebay Inc.